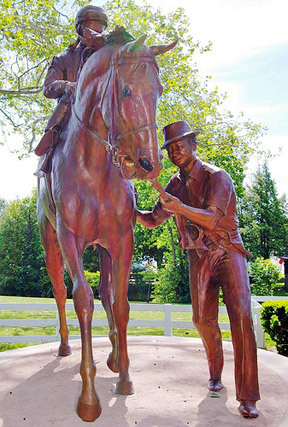 Statue of Eddie Sweat with Ron Turcotte and Secretariat. In Britain the term “stablehand” was used to convey some work stature in the stable, while “stableboy” was the lowest stable employee. However, no matter the term or definition, in today’s world horse people know that a good groom is first into the stable in the morning, and last to leave. Their tasks include anything and everything from mucking out to braiding, arranging travel and transport for horses, tacking up, grooming, schooling, exercising, and the list is endless. While some grooms are transient, and move about as the wind blows, others become firmly attached to their charges. In a recent blog about American show jumping superstar, and humanitarian Kathy Kusner, she mentioned that when she was starting out, and making her name decades ago in the southern American states, the rules for black grooms were vastly different than for the white. She said that the black grooms were really seen as second class citizens, and were not allowed access to the food stands or certain areas of the show grounds. “I would go and get food for the boys, and bring it back to them,” she recalled. Show jumping wasn’t the only horse sport discipline where black grooms were abundant. In the racing world, the inaugural racing of the Kentucky Derby run May 17, 1875 saw thirteen of the fifteen riders as black. 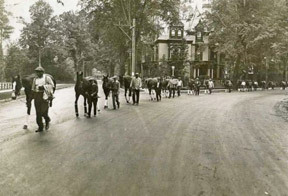 A black man Oliver Lewis, won the race, and he was actually trained by another black slave named Ansel Williamson who had honed his horse training skills to perfection. After being freed Williamson eventually opened up his own racing stables. 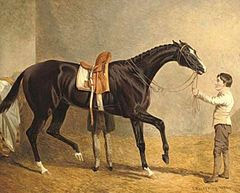 As time ticked on black jockeys dominated the sport and won fifteen of the first twenty eight runnings of the race. Originally, black slaves were the ones who took care of horses in the southern American states, while Irish and British immigrants managed grooming duties in the north. Today grooming is a serious business, and a horse may be only as good as his or her groom. There are website dedicated to grooms offering all kinds of tips and tricks to make work faster, easier and more efficient. In the good old days before liniments, fly sprays, and all the mod cons that we consider a daily part of our lives, the old horsemen had to get creative. Many of them were illiterate, but they were innovative when it came to horse care, and many made their own tools that were painted, and marked with their initials. These and other labor saving devices were well guarded; there was no tack shop around the corner where they could dash out and buy another pitchfork or shovel. As sailors had once dragged their clothes in a bag behind a ship to wash them, so too did the old grooms have to wash horse leg bandages, saddle pads and other equine and stable paraphernalia. However, since real washing machines with agitators didn’t hit the North American households until the 1940’s, and since nobody would have ever dreamed of buying one for the stables, the grooms were on their own. They devised a gizmo that looked much like a toilet plunger, and with a toss of detergent into a bucket of water, the up and down motion of this creation did a good job of cleaning. A fast rinse, and hour or two in the sun, and all was good to go! Wheel barrows were unheard of so sacking was laid out, filled, and then used to transport manure from stalls out to the back of the barn or stable. Hot water? Electricity? Not back then. One bucket, a brush and an old cloth or stable rubber might be all the grooming tools available. In the days before horse vans, and trailers, horses were shipped to the race tracks by railcar. The grooms who travelled with the horses often slept beside them and then led their charges from the train station to the track. Meal time was a lean affair, and was often just a handful of horse oats, or an egg or two from some nearby chickens. The pay was lousy too, but if you had a way with horses, could groom or strap them so that they sparkled, knew how to braid a mane to perfection, or could get a horse to focus on the task at hand and settle down, you were a valuable asset to any stable. Was he an exceptional groom? Eddie Sweat talked horse all the days of his life but his family says that “Big Red” was his favourite. He knew the horse inside out, and being the superstar that he was, the horse had a personality and attitude to match. But Eddie was dedicated to his charge and knew just how to handle the racing superstar. In 1972 and 73, sportswriter William Nack spent hours at the Laurin stables watching Eddie Sweat working with horses. The American public was fascinated, and after Riva Ridge won the Derby in 1972 and Secretariat won it in 1973, Sweat took pride in being the first groom to have worked on two back to back Derby winners. He was featured in Jet magazine and Ebony. Canadian Lawrence Scanlan wrote, The Horse God Built: The Untold Story of Secretariat, the World’s Greatest Racehorse about the amazing relationship between Sweat and Secretariat. “I wonder how many (people) listen to their animals,” Scanlan asks at one point in the book, “in the way, say, Eddie Sweat listened to Secretariat. Listened with his ears, his heart, in his bones.” Sweat died in April 1998 at the age of 59 from leukemia, but his legacy with his famous horse lives on. Walk from the train station to the track at Saratoga. Today’s grooms can take programs and courses for a Horse Groom Training Certificates that span many weeks whether for show horses, or racing stables. However, most horse owners, and seasoned grooms alike will agree that proficiency with horses doesn’t come with a graduation ceremony, cap and gown. Getting to know horses along with their ailments, personalities and quirks, how to do a task smarter and faster, time saving strategies, grooming secrets along with the myriad of other required jobs comes from dealing with horses and being immersed in them day in and day out.